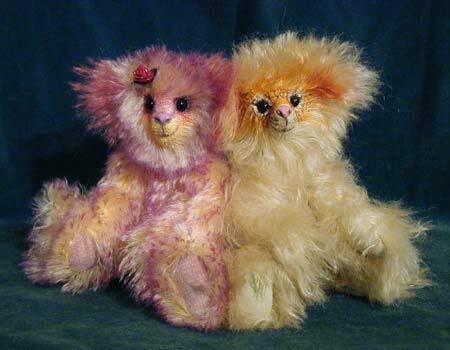 Long mohair with a second coloured mohair for the inside of her ears and the tip of her tail. Includes the trade mark hand moulded Woodland Teddies leather nose appropriately dyed and the paw pads are made using suede or leather. All bears will have glass eyes. The mohair's used for girls may be slightly longer than that used for the boys, boys may have lidded hand painted eyes.. The bears face will be needle sculpted to give shape and definition and then painted to accentuate eyes, ears and muzzle or a particular characteristic of the star sign for example the Aries bearie on the right wears a painted Tiger mask to match the flower for that sign and her name, which is Tiger Lily. Woodland Teddies wear a brass personalized name tag.